5. Any combination of the above! Today’s going to be a bit of a 2-in-1 post, since we’ll be taking a look at both methods 2 and 3 today, and examine the way artists use photographs to help create a painting. Painting from photographs may sound like an incredibly simple concept, but there’s actually a lot to it. As we’ll see, the history of using ocular devices to aid in the creation of artwork goes back quite a ways! These days, with the proliferation of cameras and printers, photographs are becoming a more and more popular tool for artists to use for reference. Painting from photos gives an artist a lot of freedom. They can work from the comfort of their home or studio (where they can control elements such as lighting), and they can paint without a strict time constraint (fresh cut flowers will eventually wilt, and models can’t sit still forever), and it allows the artist to manipulate the image they’d like to paint before they actually put paint to canvas. With today’s technology, artists can manipulate photographs on editing software to give it any effect they’d like before they render it in physical paints. (For instance, Valerio D’Ospina, one of the artists featured in our current exhibition, often desaturates the images he uses before he begins painting, as this allow him to better visualize and refer to his limited palette.) Some artists feel there are big disadvantages to painting from photographs, such as the loss of the full range of colors and values we can see with the naked eye, but other artists work around these issues with incredible results. The camera obscura is a device that led to the invention of the modern photographic camera. Essentially, it involves a space–either a room or a box–that has a very small hole in the side. When light passes through this small hole, the image of what is outside the hole will appear in the room or box, just flipped 180 degrees. This super cool phenomenon was discovered as far back as Ancient Greece (and possibly, even further back than that! ), and ever since, artists have made use of it to create more realistic paintings. As the nineteenth century began and the first of the modern cameras were invented, artists began to make use of printed photographs for reference when painting. Check out some of these awesome examples from the nineteenth and twentieth centuries (click to view the image larger)! The artists we show at Principle Gallery have a wide variety of reference methods for their work, and many make use of a combination of photographs and references from life. There are a few artists, however, who truly love the method of working from a photograph and the effect it achieves. 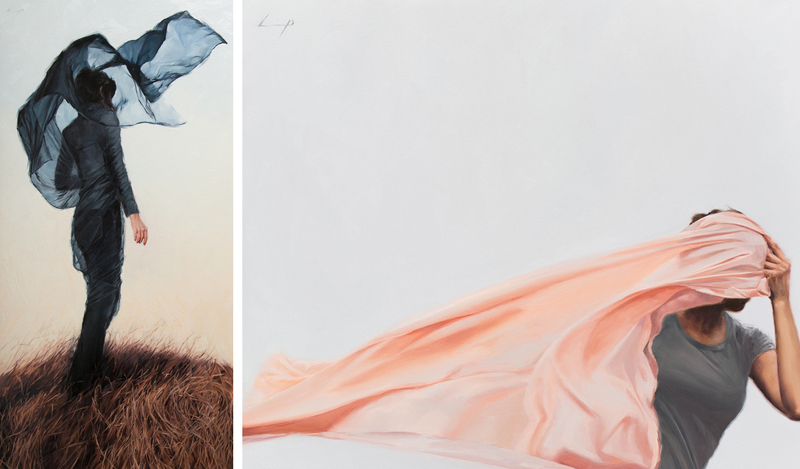 One excellent example is Delaware-based painter and photographer Laura E. Pritchett. Laura is both an avid painter as well as a photographer, and has gained a lot of notoriety and a sizable following on Instagram, where she goes by the handle @bythebrush. (Check out her Instagram here!) One of Laura’s specialties is her self-timer photography, which features Laura herself as the model, usually captured in motion outdoors. She takes her art one step further though, by using her photographs to create her beautiful, contemplative paintings as well. We just recently got some new work from Laura, which you can check out on our website here! Sometimes, a painter will go one step further and paint from a photograph while it is displayed on a computer screen. Not only is it convenient with today’s large, bright digital screens, but painting from images on a screen also often gives the image a kind of back-lit glow. You can often observe the way this glow’s effect appears subtly in the finished painting. Two Principle Gallery artists who sometimes enjoy painting from a computer screen are Anna Wypych and Jeremy Mann–check it out! Check back to see the upcoming Technique Tuesday posts about painting from life and from the imagination! To get our new blog posts sent right to your email inbox, subscribe by entering your address in the bar at the top right of the page!